In 2015, an estimated 4.5 million folks over the age of 16 fly fished at least once during the year. That’s slightly more than one percent of the population of the United States. The industry growth roughly tracks the net population growth of the U.S. Though not exploding in popularity, the fly fishing community is growing. And it’s important that new fly fishers carry on the great traditions of our sport. One legacy is what can only be described as the generosity mindset, illustrated by the catch-and-release movement of the last fifty years, stream restoration efforts, the advocacy for public lands, and the extensive volunteerism of Trout Unlimited chapter members. 1. They defer to others on the river. This seems patently obvious, but it needs to be said again and again. This is a way of thinking more than anything. It is not a sign of weakness. In fact, it’s a sign of strength. This mindset believes there’s always better fishing elsewhere, if something or someone is blocking access to his or her favorite spot. Just to be practical for a moment: If you’re not first to your spot on the river, you’re not the first. Move on. Defer to the person who got there first. Find another run. Move to another river. By the way, this also applies to fly fishing guides. Just because someone paid you for a great day of fly fishing doesn’t mean the generosity mindset doesn’t apply to you. If you can’t be a generous fly fishing guide to others (those who not your clients), then get out of the business and into a different sport. 2. They give others a wide berth. The highly generous fly fisher doesn’t just go up to the next run. He or she goes up two or three runs farther – or another mile. Or leaves to find a different river. Back to the initial point: There’s always more, not less. 3. They dole out information freely. No, I don’t think you have to tell someone your secret run. At least I won’t. But the highly generous fly fisher sees the next fly fisher not so much as a competitor but as a colleague. I once invited a friend to hunt with my family in North Dakota. Once. I never invited him again. He was so obsessed with shooting pheasants, he wanted to hunt the ditches on the way to the cornfield we planned for the hunt – 15 minutes before the 10 AM opener! He was so fiercely competitive, he annoyed the rest of us the entire day. 4. They slow down to teach young fly fishers. Young does not mean young in age, necessarily. Young means “new to the sport.” I have found so much joy in helping my twenty-something nephew get started in the sport. When he initially engaged me, I had a fleeting thought that I might not be able to fish much, because I’d be so focused on helping him tie on flies, untangle knots, and identify the best runs to fish. Instead, the common interest created a nascent friendship, and it won’t be long and he’ll be much better than I. I can’t wait. What I love most about helping younger fly fishers is that they ask questions. They want my opinion. Yea! No one wants my opinion on anything these days (not my wife, not my kids, and not even my dog!). 5. They keep their dogs in the truck or at home. Speaking of dogs, I don’t believe they belong on the river. I’ve hunted with dogs my entire life, and even the best hunting dogs go AWOL some days. If you are in the wilderness and sure you’re ten miles from the nearest fly fisher, then yes, take along your dog. But the highly generous fly fisher would never spoil the day of another fly fisher by allowing his or her unleashed dog to walk through runs or startle the fly fisher coming up the river. It’s crazy that this even needs to be mentioned. If you want a dog with you, go back to the suburbs and walk your dog around the neighborhood. By the way, did you know that the fly fisher moving up the river has priority over the fly fisher moving downstream? The person moving upstream has the right of way. So if you’re walking downstream with your dog, and it lopes ahead of you in the stream, you are in the wrong. 6. They slough off the slights. Several years ago, an intense fly fisher (who looked like a Navy Seal) stomped past Steve and me (we don’t look like Navy Seals) while we were hiking a narrow trail to a stretch of river in Yellowstone National Park. He brushed past us with not so much as a grunt. It was clear he had a spot in mind. And he got it. We were a little miffed. And after we said some unflattering things about him to each other, we laughed it off, spied him on the river later, and moved ahead of him about a mile. We never saw him again. 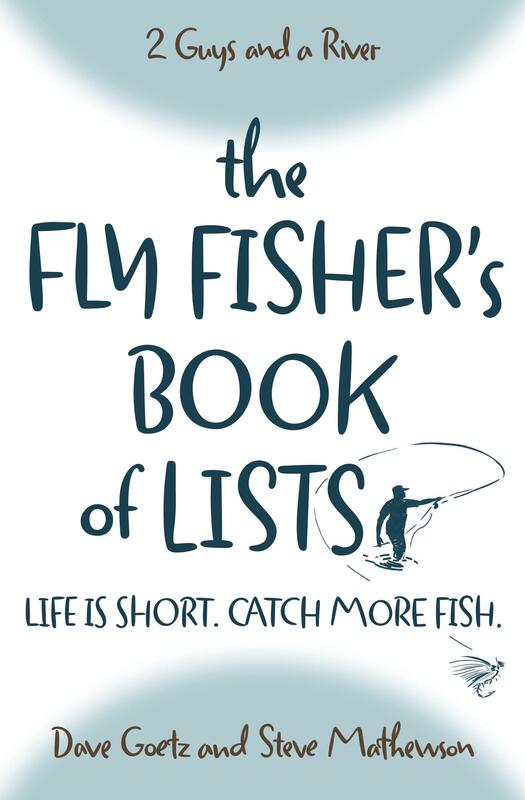 If you fly fish long enough, you’ll have the chance to be annoyed at someone. Just walk away. No need to get in the last word. 7. They share their gear. A few years ago, Steve, my podcast partner, arrived at his favorite run on the Madison River to find another fly fisher sitting along the bank. The guy had broken his rod. After catching a couple rainbows, Steve handed his rod to the other fly fisher fisher and told him to give the run a try. In case, you think Steve is the most generous guy on the planet, you should know that Steve was acquainted with this guy. They had worked together in the past. That said, however, I’ve broken my rod several times while fly fishing with Steve and he has never offered me his rod. Maybe that’s because one day on the Yellowstone, with a broken rod tip, I outfished him. My eight-and-a-half foot five weight rod became an eight-foot rod when I snapped off the last guide about three miles into the backcountry. Fortunately, the runs were right along the bank, and I could sling the hopper pattern with a modicum of precision. But wouldn’t it be great to make this a habit if the opportunity arises? Generosity begins with the idea that there is more, not less – more river, more opportunity, more fish. And so there is no need to horde. No need to compete. No need to be a grump. Just move on and find the more. This is one of the best articles I’ve read in a long time. Too many anglers take themselves too seriously. When confronted with finding someone in my “spot”, particularly one with his porcupine quills out or a gun on his hip, I find it better to just move on quietly, wishing her/him tight lines. There’s often a great spot up river. My wife and I often fly fish together and I’m happier when she catches fish than when I do. We’ve long ago worked out stream territorial issues and hope more others do too. Thanks, Gary. You’re absolutely right. It’s better to spend your energy finding a new spot than to fret about the spot you wish you could fish. There’s more river ahead! As a “young” person or “newbie”, I find this article informative and about what I expected from fly fishermen. I grew up thinking of flyfishing as a pure, gentlemanly sport, like golf. I am learning everyday and I enjoy the purity. Love the podcast and articles! Thanks, Todd! We’re honored that you’re reading and listening to what we have to offer. Once, actually, I have done this several times I got to where I was going to fish and found out I left my boots at home!? On this one occasion, I tried to only fish from the bank but was having no fun or luck. As I was walking back to my truck a guy stopped (in his car) to ask how I was doing; he offered to lend me a pair of boots and mail them back to him later. I think he and his extremely beautiful daughter were from Pennsylvania and This was near Brevard North Carolina. I really wished I had taken him up on his offer just so I could have kept in contact with him. Wow, what a generous offer! That’s a terrific story, Allen! Thanks for sharing it.